Obviously Scandal, Grey’s Anatomy, and Private Practice are all Shonda Rhimes shows and thus share a sensibility. They also share a casting director: Linda Lowy, who is married to Jeff Perry. Some of these are admittedly very minor roles. But by the rules of filmographies, everything counts! Let’s go around the circle, actor by actor, to see who played who on what show. Columbus Short is OPA’s Harrison Wright, but before that he was on Studio 60 as Darius Hawthorne, the stand-up comic hired as a writer by Matt Albie and Simon Stiles after they see him in a club. Matt Letscher played the scheming Billy Chambers, ex-chief of staff to the VP on Scandal. He had two minor roles elsewhere: On The West Wing, he’s the U.S. attorney trying to get Toby to explain the leak about the military space shuttle toward the end of the series, and on The Good Wife, he was one of Peter’s old friends whom Eli disliked. Mark Harelik played Fitz’s press secretary Marvin Colgate on the first season finale of Scandal. He’s also done one-episode roles on Grey’s, Gilmore Girls, and The Good Wife. Keiko Agena played Britta, who took over for Marvin as press secretary. (And then she got shot. R.I.P. Britta.) Agena is most famous for her role as Lane Kim, Rory’s rock-obsessed BFF on Gilmore Girls, but she also did a one-off role on the first season of Private Practice as a nun. Katie Lowes plays the sparsely eyebrow-ed Quinn, the newest staffer at OPA. Before that, she had onetime gigs on PP and Grey’s. Brenda Strong played Governor Reston’s wife, whom the governor caught in flagrante with their contractor. (He thought she was being raped, and he killed the contractor. Whoops!) Strong’s on one episode in season two of Gilmore Girls, and she’s Sally on Sports Night, the colleague who sleeps with both Dana’s shithead fiancé and Casey. She’s also the beloved dead mom on Everwood, seen only in flashbacks. George Newbern plays Charlie, one of Huck’s assassin colleagues. You can spot him in one episode each of Grey’s and Private Practice. Liza Weil was central to the first season of Scandal as Amanda Tanner, the White House intern whom Cyrus paid to have killed. Perhaps she drew on her previous White House experience from The West Wing, where she was a low-level staffer whom Leo decided not to fire, even though she leaked important information about him. Or maybe she drew on her Gilmore Girls background as the uptight, brilliant Paris Gellar. Kurt Fuller played the wrongly implicated Grayden Osborne, disgraced director of the CIA on Scandal. He spent a few episodes in the SitRoom on West Wing, did one-offs on Grey’s and Studio 60, and recurs as a judge on Good Wife. Gregg Henry plays evil douchebag Hollis Doyle on Scandal. He also played less-evil-but-still-a-douchebag Mitchum Huntzberger, Logan’s father, on Gilmore Girls, and played a doctor on one episode of Grey’s Anatomy. Debra Mooney played Supreme Court Justice Verna Thornton, whom the president smothered to death earlier this season. (She was dying anyway, but still.) Mooney played Owen’s mom on two episodes of Grey’s and did one episode of Private Practice, but to us she’ll always be the awesome no-nonsense Edna Harper from Everwood. Tom Amandes plays Governor Reston, the politician who killed the guy his wife was having an affair with. He’s been on one Grey’s and one Private Practice, but we’re most fond of his role on Everwood, as Debra Mooney’s son, the fastidious Dr. Abbott. Jeff Perry is Cyrus Beene, political evil mastermind and chief of staff to President Grant. He plays the far-less-powerful Thatcher Grey, Meredith’s formerly estranged father on Grey’s Anatomy, and he played a scheming whistleblower on a season-four episode of The West Wing. It’s not part of the chart, but he also played Mr. Katimski on My So-Called Life. The guy has range! Josh Malina plays the cereal-loving David Rosen, whose legal career fell apart after a woman was murdered in his bed. (He didn’t do it! But he didn’t call the police — he called Olivia.) Malina is on one episode each of Grey’s and PP, and he starred in both Sports Night and The West Wing. Oh how we wish he got to be funny more often on Scandal. Free David Rosen! Bellamy Young plays the First Lady Macbeth on Scandal. She played the same character on two episodes of Grey’s and Private Practice, and she played an angry southern lawyer on one episode of the fifth season of The West Wing. Kate Burton plays the scary, power-hungry vice-president on Scandal. She also played Meredith’s scary mom on Grey’s Anatomy, a senator in one episode of The West Wing, and has appeared as opposing counsel on a few episodes of The Good Wife. Scott Foley is the mysterious military guy who seduces and spies on Olivia. Previously, he was the sad, sad Henry on Grey’s, who of course tragically died, because that’s how love works on that show. 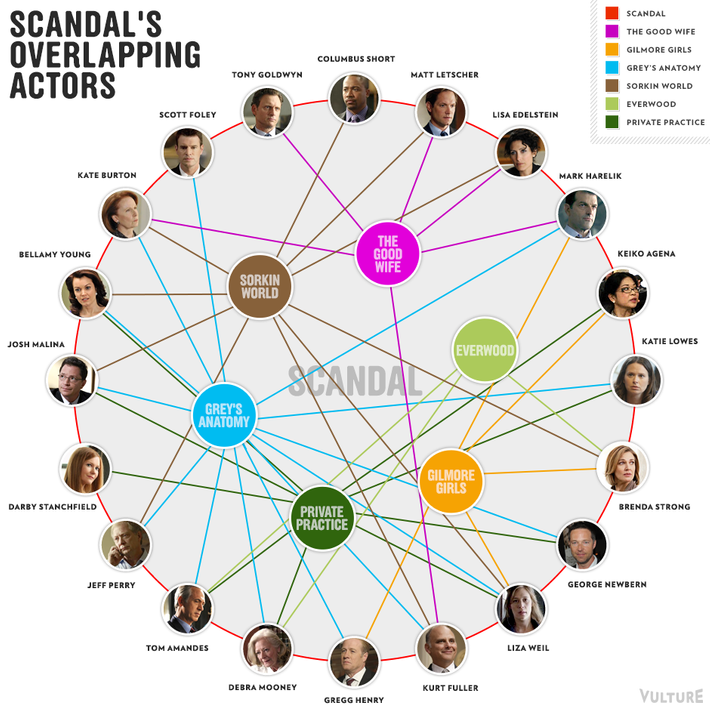 It’s sort of how love works on Scandal too. Tony Goldwyn plays the drunken, emotionally manipulative President Fitz. He played a judge on one episode of The Good Wife, but, more important, he was in Ghost. Though that’s for another chart.